KELOWNA, B.C. 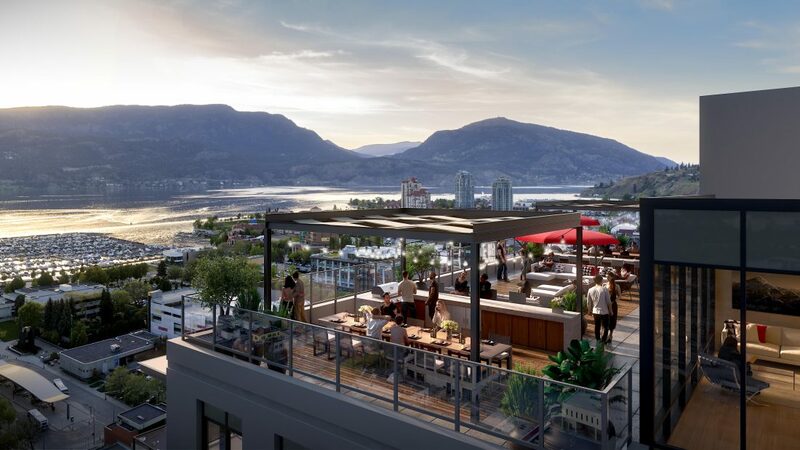 Mission Group reveals today it is building Kelowna’s highest rooftop lounge and outdoor terrace with unparalleled views of the city, mountains, and Okanagan Lake. The open-air rooftop space will sit atop Brooklyn at Bernard Block at a height of over 200 feet. Brooklyn at Bernard Block is a 25-storey concrete condominium tower planned for construction at 1471 St. Paul Street just off Bernard Avenue. Brooklyn’s rooftop ‘Okanagan oasis’ features a sunbathing patio with seating, al fresco dining area with barbecue, wood decking, raised fire pits and 360-degree panoramic views. It is intended as a common area where Brooklyn residents can come together as a community or enjoy with invited guests. Photo credit: supplied by Mission Group. See media contacts for high resolution images. “Brooklyn’s rooftop will be for the exclusive enjoyment of Brooklyn homeowners, offering them a unique vantage point overlooking the city,” she adds. The rooftop terrace is complemented by the Brooklyn club lounge which is an indoor social area for residents. The aim is to give homeowners the chance to entertain guests on top of Brooklyn throughout the year. Property in Kelowna and the surrounding area continues to be in high demand. A Royal LePage forecast published this month predicts 7% growth in recreational property prices in the Okanagan Valley this year. Sales of Brooklyn are expected to start this Summer with competitive pricing from the $300,000’s. Please register at www.liveatbrooklyn.com to receive updates on this exciting new development. Brooklyn is within short walking distance to Bernard Avenue and some of the Kelowna’s best attractions such as Okanagan Lake, the new Kelowna Yacht Club and the recreational City Park and waterfront boardwalk. The condominium tower is zoned for short-term rentals and has an exceptionally high Walk Score® of 98 out of 100. Brooklyn at Bernard Block is part of a three-phase plan that will eventually include two additional condominium towers on Bernard Avenue. Headquartered in Kelowna, Mission Group specializes in residential and commercial real estate development and construction. Each Mission Group community is given careful thought and consideration long before construction begins. Their goal to create and nurture homeowner relationships, as well as their modern and well-built designs has earned them numerous industry awards over the years. These include the Canadian Home Builders’ Association Tommie Gold Awards for Excellence in Creating a Low-Rise Multi-Family Development (2016), Excellence in Semi-Detached or Townhouse Development (2016), Built Green B.C. Builder/Renovator of the Year for Winsome Hill in 2012 and Multi-Family Builder of the Year (2014).